I have to say, I was feeling a bit sceptical about buying another boxed game from GW when the rumours were talking about this. I’d decided that I would probably buy it if the miniatures looked good enough that I could use them for my Age of Sigmar army, but then we started hearing about Warhammer Quest making a return, and my intrigue level spiralled up to 9000! I’m not one of these people who played this game growing up, so I don’t have the nostalgia factor here. However, I do enjoy a good dungeon crawl game, and this seems to have that in spades! The overview video puts me in mind of something more akin to the D&D adventure system games, which is a huge plus in my view (check out my reviews of Legend of Drizzt and Wrath of Ashardalon for more on those games!) I like the idea of going up against the minions of the sorcerer, and the AI for the enemy characters looks like it could be straightforward enough that games don’t end up as a clunky mess. More than anything, however, I like the way GW seems to be looking to expand on this. While I don’t quite believe the rumours that say this will be a ‘third main line’ alongside AoS and 40k (we’re still waiting for plastic Heresy stuff to be a ‘third main line’, after all), the internet has seen a lot of talk of the game having new heroes added over time, so who knows what they’ve got planned! 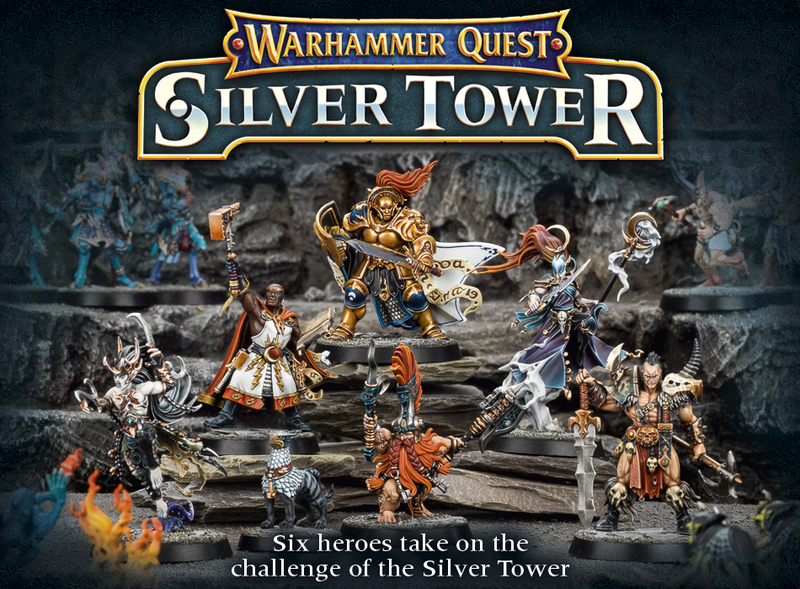 They are bringing out an app to support the game that will provide hero sheets for all of the AoS heroes, however, and White Dwarf has warscrolls to use the Silver Tower minis in the main game, so I’m more inclined to think this will be a subsidiary to AoS. It looks like this game could be awesome, and I’m finally decided to pick up a copy, despite the hefty, hefty price tag, when it’s released next weekend. These new warscrolls, where are they available to download from? I couldn’t find any, only the ones for the ST heroes to use in AoS and those were in WD. Sorry, I got confused with the minisite and the app! Corrected now, anyway – thanks for mentioning that! Mind you, there are those people who preordered in store and got foil cards for the main heroes plus 4 new ones.